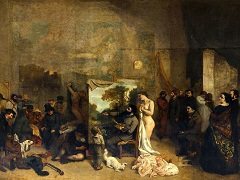 Gustave Courbet is relatively unknown in 1851 when the government-sponsored art exhibition, the Paris Salon, presents his 20-foot-long masterwork, A Burial at Ornans. 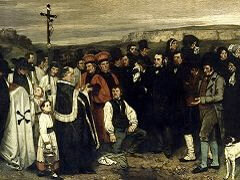 The frieze-like portrayal of somber middle-class citizens at a graveside in Courbet's home province generates an explosive reaction among the painter's audience and critics. With few exceptions, viewers react to the work as an assault on the very idea of what a painting should be. To sophisticated Parisians, rural folk are considered proper fodder for small genre pieces; it's unprecedented to accord them the magisterial scope of the historical masterpieces of French tradition. 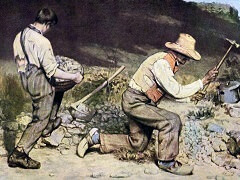 With the worker uprisings of 1848 a recent memory, Courbet's use of the common people as a grand subject is deemed a radical act -- "the engine of revolution," as one critic says. 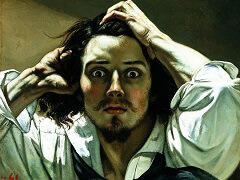 Furthermore, in his push towards a realistic style, Courbet has intentionally painted his black-clad folk in a manner that does not idealize their suffering. The Salon audience is accustomed to paintings that poeticize and uplift, and they read Courbet's grieving figures as vulgar and ugly. One critic writes, "He paints pictures as you black your boots." 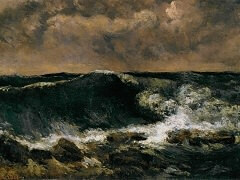 The exhibition makes Courbet famous, and he describes A Burial at Ornans as the "debut of my principles." Within a few years, he embraces Realism, a term originally used derisively by his critics. He writes that his purpose is to use art as a way toward self-knowledge, to "translate the customs, the ideas, the appearance of my epoch according to my own appreciation; in a word, to create living art, that is my goal." Many art historians view Courbet's stubborn independence and determination toward artistic freedom as an important rupture with the Salon-controlled painting of the past, an inspiration to the next generation of innovators, the Impressionists. 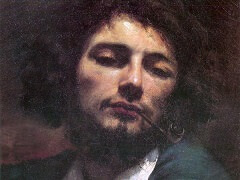 During his lifetime, Courbet remains a rebel and bohemian, finding success outside officially sanctioned quarters. He is the first painter to sponsor his own, self-financed exhibitions. His support for the poor and oppressed runs afoul of shifting French politics. Near the end of his life, in the 1870s, he is jailed briefly for his association with the Paris Commune, a failed revolutionary movement. The French government imposes exorbitant fines on Courbet, and rather than face bankruptcy, he flees to self-imposed exile in Switzerland. There he continues to paint for the last four years of his life. Shortly after his death in 1877, his sister donates A Burial at Ornans to the French Ministry of Fine Arts. 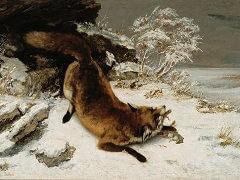 It now resides in Paris' Musée d'Orsay alongside other treasures of 19th century French painting.